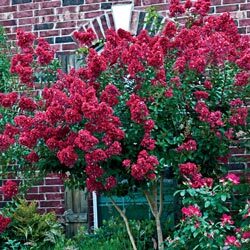 Gorgeous landscape plant gives you huge, reddish-pink bloom clusters throughout the summer. 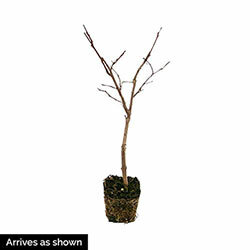 With its highly ornamental bark and large, profuse flower clusters, you'll enjoy this garden beauty year round. Bloom Time Mid summer to late summer. Foliage Type: Elliptic-ovate, lustrous medium green. New growth has a bronzy-pink cast. Develop an attractive light maroon to bright red color in fall. Bloom Time: Mid summer to late summer. Flower Form: Large decorative panicles of many small frilled flowers with crinkled petals. Extremely beautiful. Planting Instructions: Adaptable to many soils so long as they are well drained. Firm and water in well. Soil Requirements: Well drained, tolerant of heavy clay soils. Growth Rate: Fast once established. Pruning: To shape and for aesthetics. Also remove spent bloom panicles to encourage repeat blooming. Winter Care: Mulch in colder climates, remove in early spring before growth starts until plant is established.